The U.S. logged annual rent growth of 3.2% in 1st quarter 2019. That marked the second consecutive quarter of annual rent growth above 3%. 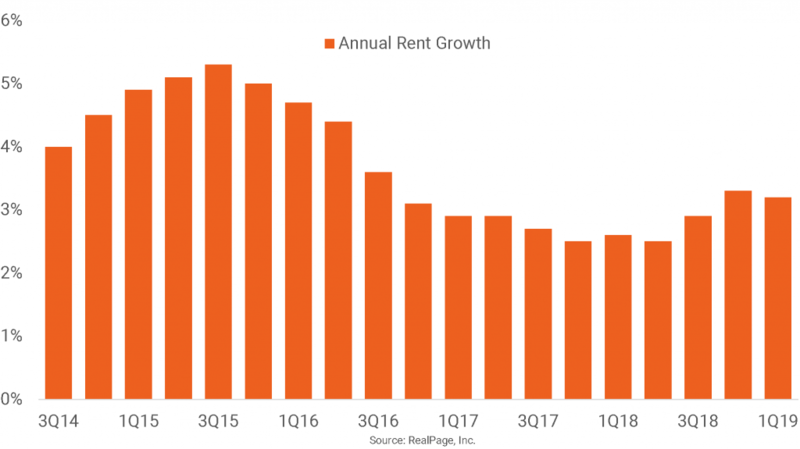 Annual rent growth has not been that high since 2016. In 2017 and in much of 2018, the nation recorded average annual rent growth around 2.7%. Those were some of the nation’s weakest performances since the Great Recession. The improved rent growth performance of late comes as occupancy has been above 95% for the past five quarters. As usual, the West region markets led for annual rent growth, with rents climbing an average of 3.6% over the past year. The Midwest was the laggard, with annual rent growth of 2.9%. Charlotte Wheeler is a Real Estate Writer for RealPage, Inc., where she leverages her extensive experience in market research to produce apartment market insights. Charlotte also serves as a copy editor for RealPage’s market reports, focused on ensuring accuracy and clarity of data and analysis. Prior to joining RealPage in 2009, Charlotte specialized in research at a commercial real estate firm and at the Dallas Regional Chamber. Charlotte holds a bachelor’s degree in economics and finance and a master’s degree in political economy from the University of Texas at Dallas.